Looking like a food of the Jetsons on the one hand, the calabash squash is part of quite a few primitive cultures. Photo by Nathalie Dulex | SXC. This is Page 8 of an eight-page glossary featuring different types of squash. 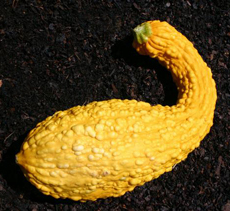 Here, squash types beginning with S to Z include spaghetti squash, yellow squash (yellow zucchini) and zucchini; as well as more exotic squash types such as sweet dumpling squash and turban squash. (Click here to recommend a variety we haven’t included.) There’s also a general overview of summer versus winter squash. Click on the black links below to visit the other pages. See our more than 50 other food glossaries, each featuring a different favorite food. 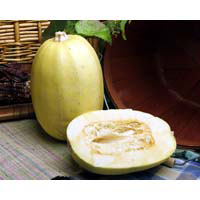 This watermelon-shaped squash is known for flesh that separates into long, blond, spaghetti-like strands as it cooks; the squash lends itself to any recipe that regular spaghetti would. The strands can be used in salads, casseroles or on a plate with sauce. The squash is mellow-tasting with a slight crispness not found in pasta. A novelty the first time one experiences it, it is always fun to halve the squash lengthwise and rake the strands out of the oval shell. The more yellow the rind, the riper the squash. See also Orangetti Squash. Available year-round. Best season is early fall through winter. Summer squash is a category of thin-skinned squash; the skin is edible and bruises easily. The flesh is moister, due to higher water content, than winter squash. Examples include zucchini and yellow squash like the crookneck squash at the right. They have a relatively short shelf-life: two weeks in the refrigerator. Different varieties of summer squash are found in yellow, green and white. 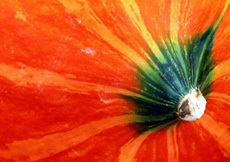 The cream or daffodil-colored rind of this pretty squash boasts thick deep ribs, which are lined with green or orange. Sweet dumpling squash lives up to its name for being sweet and tender. 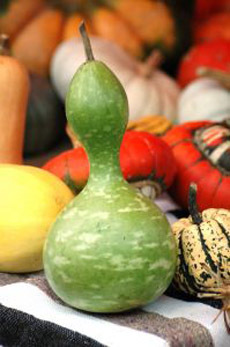 The petite squash can be held in one hand, making it a “dumpling” in comparison to other squash with ribbed, pumpkin-type shapes. It’s a great size for roasting or baking as individual servings. 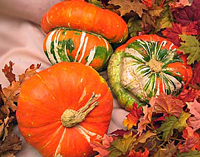 The turban squash is distinctively shaped like a sultan’s turban and can be strikingly colored. It can vary from orange, red, green and white, sometimes combining all four colors as shown in the photo at right. The flavor of the yellow flesh reminds some of hazelnut, and its good size makes a wonderful bowl for an individual serving of soup when it is hollowed out. The bottom can be cut off to be hollowed out or stuffed. Available year-round. The best season is late summer through early fall. Winter squash is a category of squash that has hard, thick rinds that are not edible. Examples include pumpkins and acorn squash. The flesh is drier—less moist—than summer squash. Kept in cool, dark places, winter squash will have a shelf life of up to three months. Yellow squash comes in a number of varieties including crookneck, straightneck, pattypan and yellow zucchini (photo at right). The crookneck has a curved bottleneck, while the straightneck is straight. Pattypan are small dreidel- or top-shaped (like a spinning top) squash with scalloped edges. Like all summer squash, they are have an edible thin skin that does not need peeling, and are usually tender and mildly sweet. Often paired with its cousin, yellow squash, zucchini is one of the most popular summer squashes. Its mild flavor is versatile; it can be eaten raw, grilled, fried, sautéed, baked, tossed in salads, in pasta dishes, on sandwiches, or even baked into bread and cake. Look for glossy, firm, dark green skin. 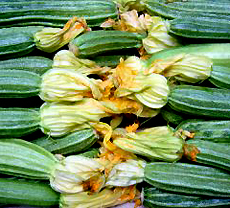 The flowering tip of the zucchini is a gourmet delicacy. It is generally served as a side dish, sautéed or deep-fried. Available in the spring and summer. Photo by Barbara Bar | Morguefile. Melissas.com has supplied a substantial amount of information and photography for this glossary.